Photo source: Islas Comores. Some rights reserved. The basic diet of the Comorians consists of rice, potatoes, corn, fish, coconuts, and bananas. Other crops that are grown are sweet potatoes, citrus fruits, and pineapples. The physical needs of the Comorians are numerous. 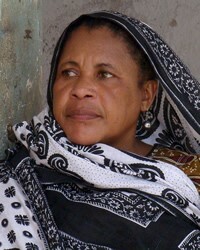 Major problems on the Comoros Islands include poverty, disease, and hunger. Educational levels are low, and less than half of the population is literate. The spiritual needs of the Comorians are even greater than their physical needs. Though freedom of religion exists on the islands, evangelism is not well received by these Shafiite Muslims. Their commitment to Islam, coupled with involvement in occultish practices, has made these people difficult to reach. * Ask the Lord to call people who are willing to go to the Comoros Islands and share the Gospel with Comorians. * Ask the Lord to send Christian teachers and medical teams to work among Comorians. * Pray for the availability of the Jesus Film in the primary language of this people.View Comorian, Ndzwani in all countries. Location in Country: Anjouan Autonomous Island.